Say it ain’t so, Stars fans. After dropping five-straight games to end the season, the Dallas Stars will not partake in postseason festivities for a fourth-straight year. The bitterness of being a Stars’ fan has reached its pinnacle, as good news is scarce in the Dallas franchise. Undoubtedly, this is one of the lowest points in franchise history–especially considering the crown of thorns the Stars must bear after having the worst power play in the league. Despite holding the Pacific Division lead with only a few games left, the Stars once again found a way to buckle and watch the division and a playoff berth slip from their grasp. The most critical juncture came when the Stars faced the Sharks, who clinched the seventh seed in the West, in back-to-back games. With the division and the playoffs riding on those games, Dallas could not rise to the occasion, and simply watched the season slip away. 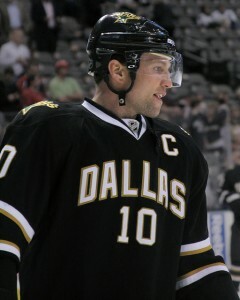 Talking about the Stars home loss and second-straight to the Sharks, Stars Captain Brenden Morrow summed up the mood. But the help didn’t show up for Dallas, as San Jose, Los Angeles, and Phoenix all collected points in the final few games, something the Stars could not muster. The Coyotes seemed to come out of nowhere and claim the Pacific Division title. The Stars must be able to compete better and capitalize on their intra-division games if they hope to make the playoffs. Another long and winding road for the Stars. My preseason prediction saw the Stars claiming the seventh seed and making the postseason. Seeing that Dallas had added some above-average players during the offseason, it seemed the team would finish higher than last year’s 9th seed. However, the Stars actually finished lower this season, claiming the 10th spot in the West. Some areas of the game–such as goaltending and penalty killing–improved for Dallas, but other areas languished, primarily the power play. Although I have high hopes for the future of the organization, the team did not improve over last year, and in many ways, slid sideways or even backwards. With a 13.5% power-play percentage, the Stars were tied with the Phoenix Coyotes as the worst in the league, but Dallas finished with the fewest power-play goals scored, with only 33 goals in 244 opportunities. Both the percentage and the power-play goals scored were the worst in Stars franchise history, eclipsing marks set in the mid 1970s when the season was only 78 games. Although the penalty-killing unit was a boon for the team down the stretch, the power play wavered at key moments and ultimately represented the collapse that the Stars succumbed to. This all seems too familiar. The parallelism between this season and last season is surreal. In both years, the Stars started the season rolling as one of the top teams in the West. As the season wore on, however, Dallas began to slide, and by season’s end, making the playoffs hinged on the final few games. Last season, the Stars went into the final game simply needing to beat the Minnesota Wild, a team who had already been eliminated. The Stars were incapable of rising to the occasion, and watched as the playoffs glided past them. This year, the Stars tripped at the most critical moment of the season. In both seasons, the key problem seems to be depth. If the Stars face one or two injuries, or if key players go through a cold stretch, the team flounders. Also, General Manager Joe Nieuwendyk’s trades from this season and last season should be called into question. Looking back, trading James Neal and Matt Niskanen for Alex Goligoski seems to be a lopsided deal. Goligoski has been an overall solid defenseman, but if the Stars are unable to resign him before his contract expires, the trade will have been for nought. The Penguins re-signed Neal to a long-term contract, who hit his prime just after the Stars traded him by recording 40 goals and 41 assists this year. Niskanen also has been playing well for the Penguins since leaving the Stars. Defenseman Nicklas Grossman was traded to the Flyers for second- and third-round draft picks, yet the Stars continue to suffer from a weak defense. Trading Grossman this season seems to have been an unwise move, especially considering he has burgeoned under the Flyers system. Philadelphia has since signed him to a multi-year deal. Having another experienced defenseman such as Grossman would have greatly benefited the Stars down the stretch. Although the present is dim for the Dallas Stars, the future seems emphatically bright. Finally, having an owner who is committed to winning is the ingredient the organization needs. The Stars have a strong foundation in place with young talent up front, solid netminders, and a few reliable defensemen. 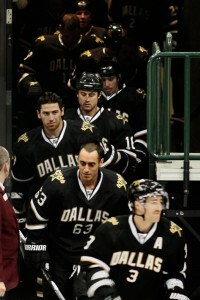 But, as of now the Stars are, simply put, a mediocre team. Much of that has to do with the team’s lack of depth. In the NHL, depth is key. Nieuwendyk needs to build the team up by adding more depth in the defensive zone and on the second and third lines. Adding Sheldon Souray, Michael Ryder, and Radek Dvorak were positive steps in that direction, but much more needs to be done. Nevertheless, there is hope in the organization. With an owner who says he is committed to winning, the Stars can resign key players and sign needed free agents. The Stars should be able to put into place a strong contender for the future. Although this season ended in disappointment, I have a feeling the Stars will break their four-year drought of missing the playoffs next season, but making practical transactions during this offseason will be crucial to ending that stretch. Hang in there, Stars fans!